Cottonwood in central Arizona is attractively situated along the Verde River valley, at the foot of the Black Hills which rise to a height of 7,815 feet at Mingus Mountain. The valley has a relatively low elevation of 3,300 feet so is mild in winter, and not too hot in summer. There are two main roads through Cottonwood; Hwy 89A (a bypass route) to the south and Broadway or Main Street to the north, along which are found a selection of restaurants and small shops. Broadway continues into the adjacent, smaller town of Clarkdale, and has turn-offs to two popular parks, both just the far side of the river. 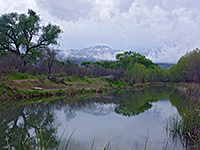 Dead Horse Ranch State Park features lagoons, meadows and riparian woodland, with many hiking trails, while Tuzigoot National Monument preserves the ruins of a 12th century Sinaguan pueblo. Larger stores and other facilities in Cottonwood are concentrated along a one mile section of Hwy 89A on the south side of town, extending a little way along Hwy 260; these include Wal-Mart and two supermarkets (Safeway, Fry's). At 993 S Main Street, The Best Western Inn of Cottonwood, AZ, has quite a central location, at the northwest corner of the junction of highway 279 with US 89 - within a mile of supermarkets and a Wal-Mart in Cottonwood, and 3 miles from the main natural attraction in the area, Tuzigoot National Monument. The 77 rooms of the AAA Three Diamond-rated Best Western include several casitas - more exclusive accommodation with patios, refrigerators and separate entrances - and many have relaxing views over the hotel's central garden, outdoor pool and hot tub. The building is 200 feet away from the main road and so nice and quiet; the other main facilities are free continental breakfast, 24 hour front desk, and a meeting room. Rates are quite reasonable and the staff very friendly. The Quality Inn hotel in Cottonwood is situated towards the west edge of town, between the Verde Valley Medical Center and Cottonwood Airport, on the south side of US 89. There is one restaurant adjacent to the hotel (Franco's), others nearby, and the Verde Shopping Center is 1.3 miles away. An attractive landscaped garden greets guests at the front of the hotel, though the accommodation block is at the rear, in the middle of a large carpark; there are 51 spacious rooms, some overlooking the outdoor pool & hot tub. The inn has conference facilities catering for up to 300 people. Super 8 Cottonwood occupies a sturdy-looking, adobe-style building with two floors, exterior corridors and 52 rooms, looking out over a mixed residential/commercial neighborhood a little way south of the town center, within walking distance of plenty of restaurants and several large stores including Sears and Safeway. Wi-fi and continental breakfast are complimentary; a business center and outdoor pool are the other main facilities. Accommodation is basic, but rates are low and the staff have a good reputation.